The water testing developed specially for fisheries has been accredited by the UNESCO Microbial Resource center for Marine Biotechnology, at the Mangalore College of Fisheries. It is compact, user friendly and accurate, even while giving Instant results. No need to take your samples to expensive laboratories now. Each kit can test 9 parameters, each of them 100 times. You can test pH, Hardness, Alkanlinity, free carbon dioxide, Nitrates, Dissolved Oxygen (DO), Hydrogen Sulphide, Ammonia and Phosphate. Compact, portable, user friendly, accurate and instant results. 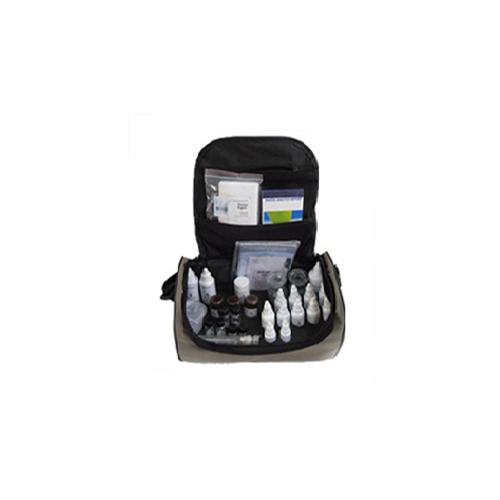 The Kit consists of all the chemical reagents, glasswares and other accessories required for the water testing. The Kit is provided with convenient operating manual to guide the users through the test protocol with color chart to compare and arrive at at results.